My next stop after Catania was Ragusa Ibla, about 2 hours drive south of Catania. My reason for coming here was food related for it is home to the only two star Michelin restaurant in Sicily (there are other one stars). Truth be told, I had also tried to do some research on other Sicilian restaurants through this one Italian food blog I found. As it was written in Italian, I needed the help of ‘Google Translator’. While ‘Google Translator’ translates words fine, it translates meanings less well, and after a little while spent trying to ‘translate’ the translation, I found myself giving up. Anyway, Michelin pointed me to Ragusa Ibla, the old part of Ragusa, which is not to be mistaken for Ragusa itself, the new town. A Unesco World Heritage site, it is built upon a hill and extremely beautiful, with narrow ancient streets that makes the thought of driving a car through them seem impossible (although it is possible for there are in fact cars here). 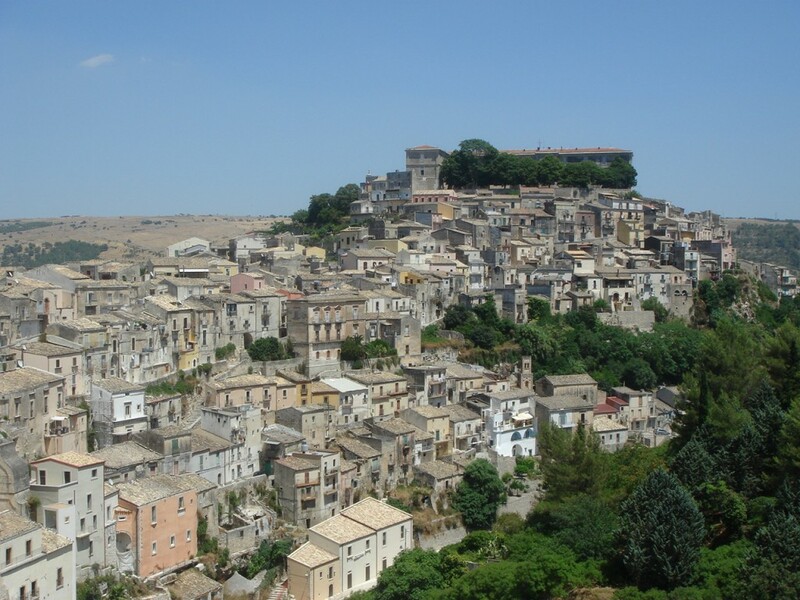 It also has to be said that Ragusa Ibla is tiny, tiny, tiny. If you can imagine a scene where the older generation of men from the town while away their days sitting in the main square watching the world go by, then you have pretty much captured the essence of this place. I must admit to a small bout of worry that there would not be enough to keep me busy for the two nights that I had planned to stay here. But after a while, I too cottoned on to the sheer pleasure of watching the world go by, especially with a cappuccino and a good book to hand. So the only thing of real interest that I can report about my stay in Ragusa Ibla is part of this conversational exchange that I had with the kindly Sicilian guy at the tourism office who helped me arrange some accommodation in Palermo, my next stop after Ragusa Ibla. “Is Palermo safe?” I asked, to which his response was: “yes, yes, not like in the movies, don’t worry,” as if to alleviate any fear I might have had about gun toting Mafioso. To be honest, that hadn’t been exactly why I made such an inquiry, but his demeanour was enough to let me know that I might not have been the first stupido turista to ask that particular question. But he was really nice about the whole thing, which led me to another question, one that I did not ask him, which was what is it about some Italian men that makes them so easy on the eye? I digress. Back to the restaurant which is called Ristorante Duomo. Housed in a Baroque building, the atmosphere was quite austere. The waiting staff were unsmiling as I entered the restaurant and I found the formality of the place almost a little overwhelming. The decor is in keeping with the period elements of the building with its baby-blue floral patterned wallpaper, yellowy floral patterned curtains and black granite-looking tiled floors. From the a la carte menu, antipastas and pastas hover around the €30 mark, and mains are priced at around €40. I settled on one of the three degustation menus on offer, the Siquilia which was priced at €130 with matching tasting wines. I opted for this menu, but without the wines, and so was only charged €100. Having scrutinised the a la carte menu closely, I had quite a hand in choosing what I eat as part of this tasting although this was meant to be a ‘surprise’ menu. Therefore, if someone else had chosen the same menu at Ristorante Duomo on the same night, it is quite probable that they would not have been served what I was given. The other two degustation menus do not include wines, but contain two additional courses, with one menu being a mixture of both fish and meat (€130), and the other being just seafood (€135). 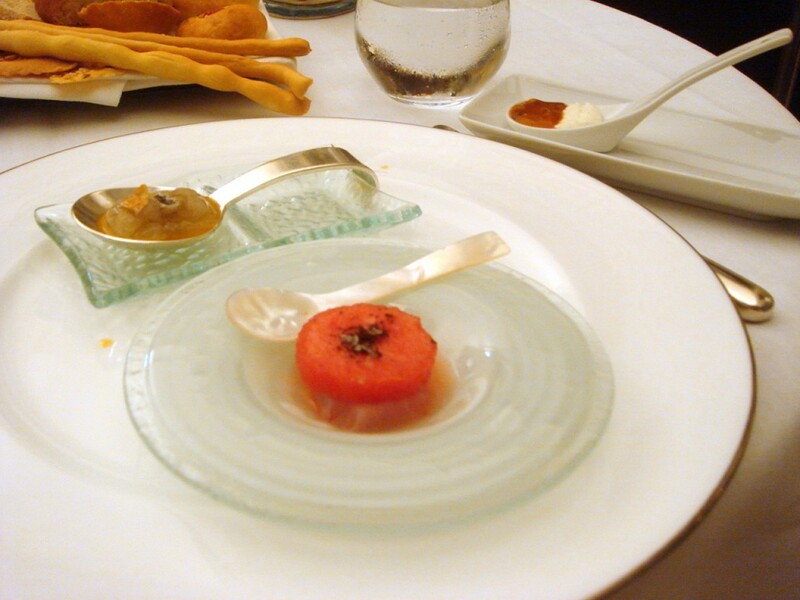 The amuse bouche was a tomato sorbet sandwich topped with julienned carrots and celery. The sorbet was cold and refreshing, but it lacked a strong taste of tomato. Finished with a dressing of olive oil and herbs, this too, was quite bland. 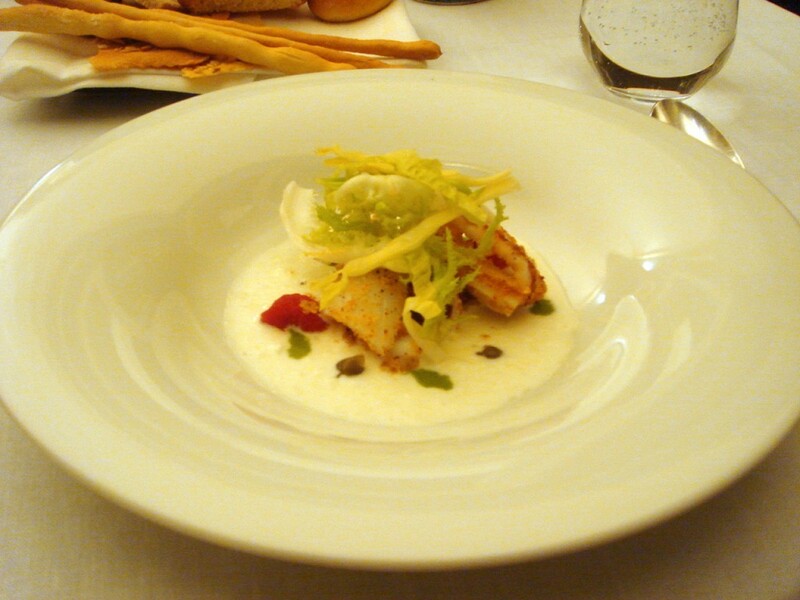 The first course was itself a ‘tasting’ of raw seafood (€75 if taken from the a la carte menu). From the bottom item in the photo, in a clockwise direction, I had amberjack with watermelon, vermouth and coffee powder; white shrimp with honey and rose petals; and sea urchin with ricotta. The amberjack is quite a strong tasting fish, almost like strong tuna, but the sweet delicacy of the watermelon cut the fishiness quite nicely, although it was difficult to detect the taste of the coffee or vermouth. The rose petals worked well with the shrimp by adding an aromatic fragrance, and there was a nice twist of lemon rind in the creamy sea urchin and ricotta taster. Overall, I found the combinations interesting, but their flavours were unspectacular. Next were bite sized pieces of Ragusano cheese, pressed bottarga (dried tuna roe) and anchovies, layered on top of each other, which was to be eaten alternately with a cream of peas. The peas were lovely, but the tuna was overwhelmed by the strong cheese and the salty anchovy. To the final raw seafood taster which was smoked swordfish with cantaloupe. This was my favourite of the lot as the summery sweet fruit worked really well with the subtly smoked fish. There was also a drizzling of pistachio puree, which served more to create a visual impact, but did little to enhance the swordfish. The next course was a crumbed calamari ‘salad’ in a buffalo mozzarella soup (from the a la carte menu, a mixed seafood salad option is available for €29). The calamari was only partially crumbed, and the crunchiness from the crumbing effect provided a fantastic textural contrast to the tender calamari. However the mozzarella soup itself was quite bland, although it was greatly helped by the addition of a few capers and some exquisite cherry tomatoes. I must now confess to finding the whole experience of eating thus far a little stressful! The food came out fast and furious – no sooner had I finished one dish, then the next would be served. What happened to go the go-slow Italian mojo I wondered? So I requested a little break, but not before this rather delectable concoction – a Sicilian summer truffle ice cream, sandwiched between two pieces of crostini and smothered with slices of truffle. The ice cream was delicious – creamy ice cream with a taste of truffle. 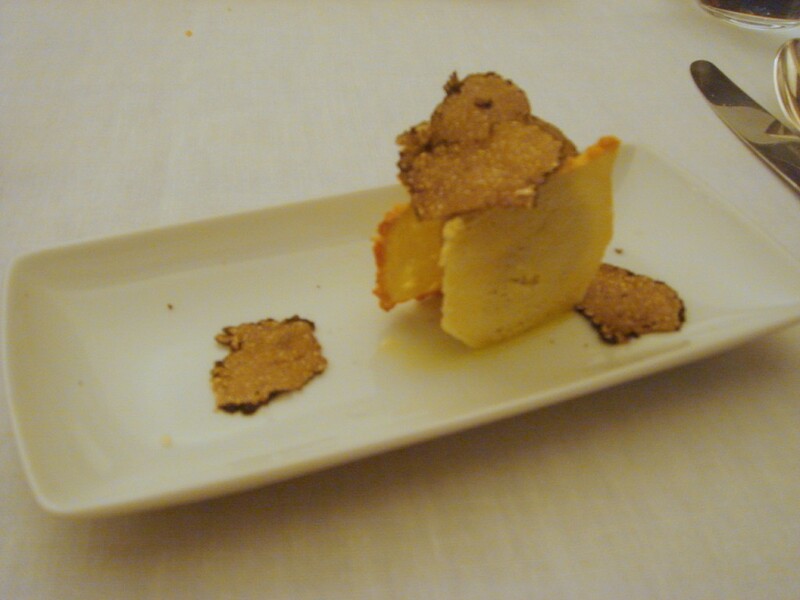 And the truffle itself, which is known in Italian as scorzone estivo from the town Palazzolo Acreide in Syracuse? It had a woodier texture than your usual winter truffles, and was slightly less flavoursome. The pasta course was spaghetti with raw sea urchins and asparagus sauce, finished with slivers of calamari (€34 if taken from the a la carte menu). I was first introduced to this dish in New York a few years ago and was keen to try it again. 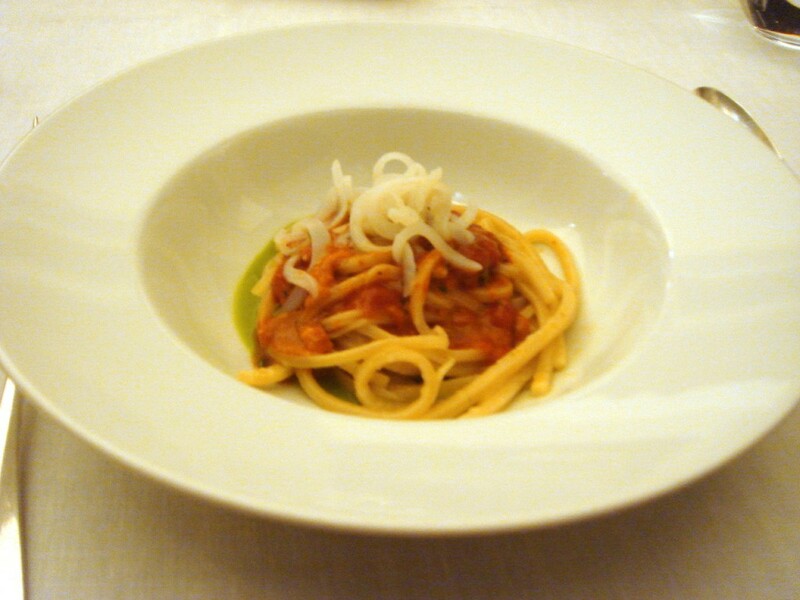 The sea urchin is placed raw on the plate, but the heat from the spaghetti slowly cooks it. The sea urchin wasn’t the most pungent that I have ever had (which isn’t a bad thing! ), and with the al dente spaghetti, left a really nice aromatic aftertaste on the palette (if you like sea urchin or can at least tolerate it). This was a very good dish, although I couldn’t understand the purpose of the asparagus sauce other than to provide colour for it did little to contribute flavour-wise. The meat dish was a black pork (€39 if taken from the a la carte menu) from the Nebrodi Mountains (the Nebrodi Mountain range runs along the North East of Sicily). The pork, darker in colour than most types of pork that you might encounter, was quite lean (no doubt due to its free range provenance) and had a rich, deep flavour. Even the small amount of fat found on the pork was tasty. It was greatly complemented by a stuffing of minced pork, breadcrumbs and tomato, and delicately sweetened with a coating of caramelised carob. The dish came with a cantaloupe sauce, but I found that the fruity sweetness of the sauce rendered the caramelised pork too sweet when the two were eaten together. There were also some roasted julienned potatoes, which went cold quite quickly due to their size. The pork itself was exquisite, but overall, the dish needed more savoury elements to it for better balance. 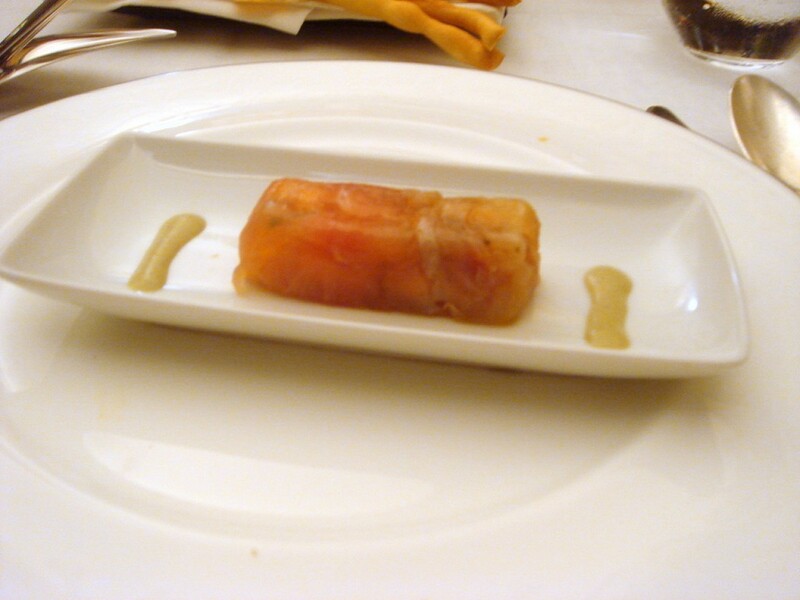 But to be fair, from observation, the Sicilians have quite sweet palates, and I suspect the purpose of having this dish quite sweet is so as to cater for local tastes. Dessert was a cannolo with ricotta, warm prickly pear soup and Noto almond sorbet (Noto is a town about 60km away from Ragusa) (€15 if taken from the a la carte menu). 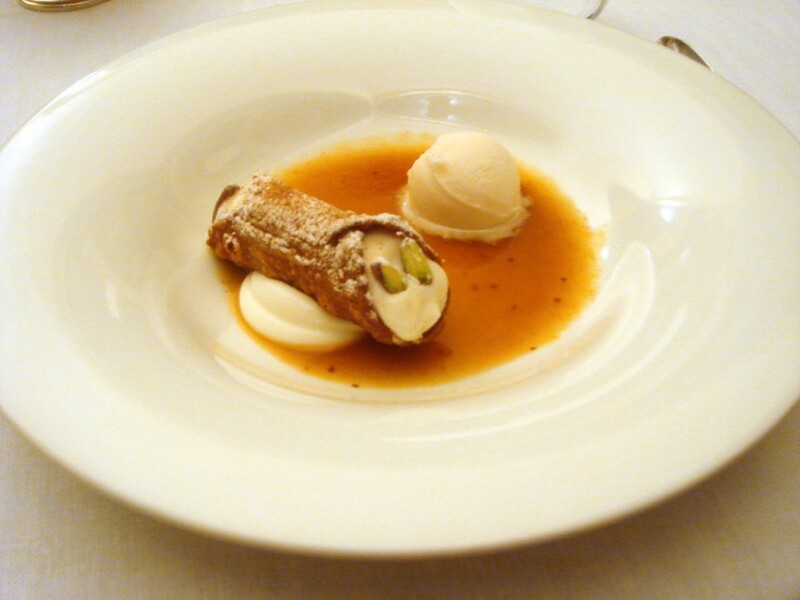 The cannolo was lovely, the centre being creamy, and the cannolo roll itself was crunchy and slightly flaky. 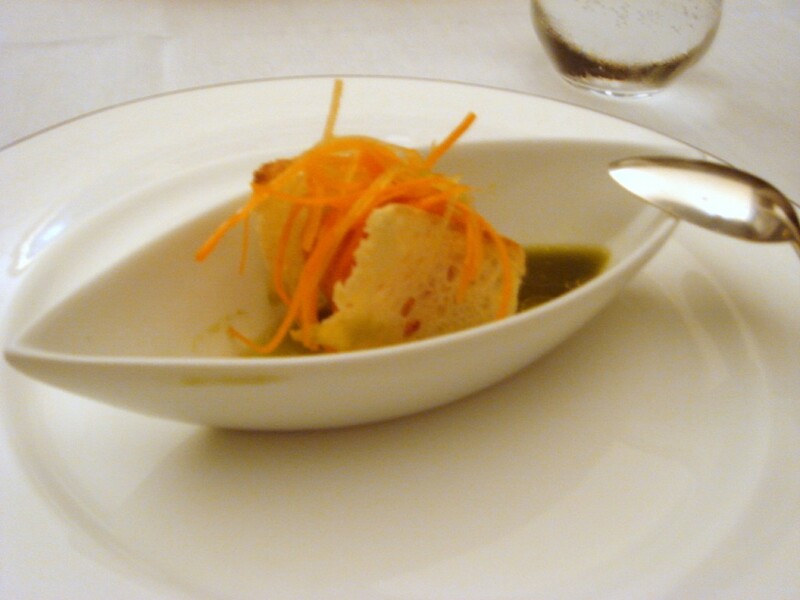 The sorbet was pleasant when first eaten on its own, but became somewhat superfluous when taken with the cannolo for its flavour was drowned out by the stronger ricotta. The pear soup was very sweet and did not complement the cannolo. This dessert lacked balance. 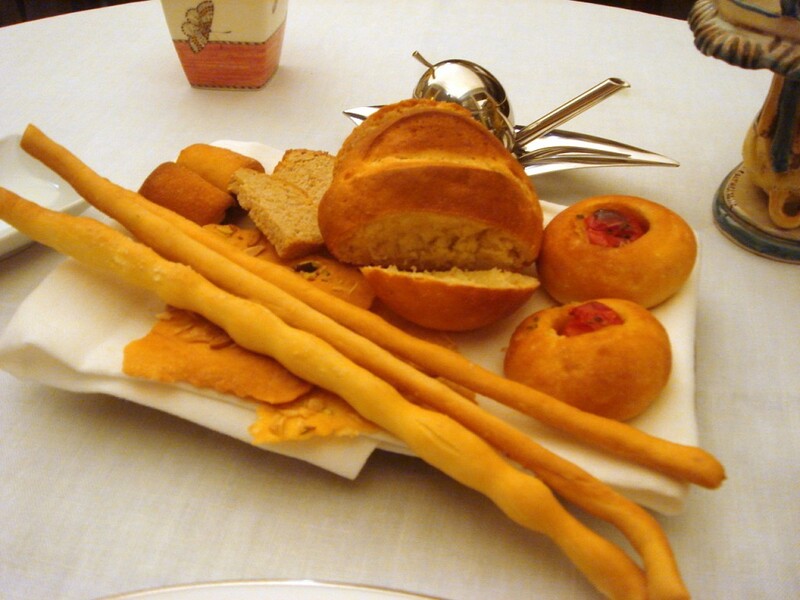 The breads were all homemade and delicious, and the petits fours were pleasant. The service improved as the evening wore on, at least it seemed like the waiters mellowed over time. I also particularly warmed to my main waiter. Ristorante Duomo is famous in this part of the world, and for some Sicilians, it is the type of restaurant that they might visit only once in their lives. Conceptually, I can understand why it has a star (but it‘s debatable for me as to whether it deserves two). There are some creative ideas here and the technique in the cooking is not flawed. But occasionally, some of the compositions lacked balance, and the inclusion of certain products, while aesthetically pleasing, did not necessarily enhance the flavours of the dishes. In more than once instance, I found that the use of fruit worked against, rather than with, the other ingredients. I thought the price I paid to be fair for what I was served. In fact, I think the restaurant was very generous in letting me select elements of the degustation menu, which they might not otherwise have chosen to serve. Overall, it wasn‘t a bad meal (I really enjoyed the truffle ice cream and the pork), but there was a sense of style over substance to the whole experience. There were some nice ideas and I will always applaud any form of creative food thinking. But at the end of the day, food is only as good as how satisfied it makes you feel. 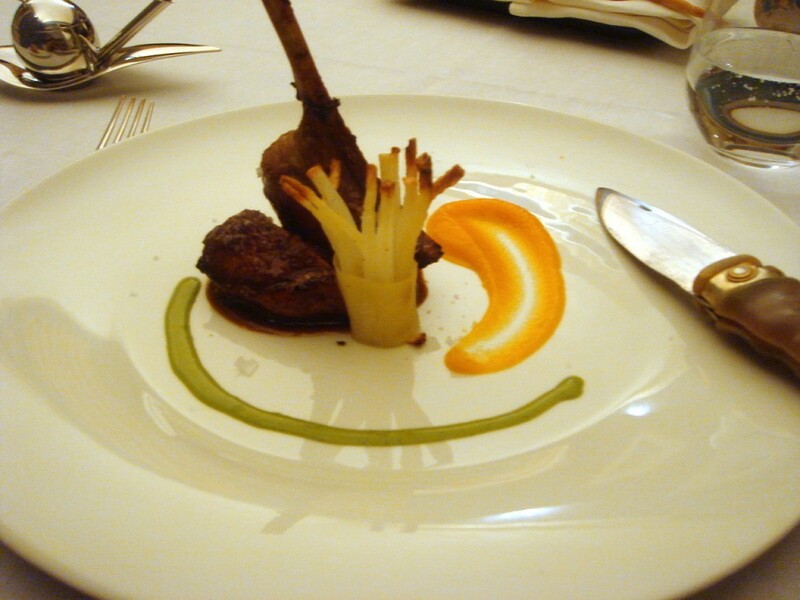 Price range – Approximately €85 for 3 courses. Excludes drinks and service. Prices of tasting menus are detailed above. have to catch up with your other posts! That is A LOT of food! You have gotta love the Italians – really enjoying your posts on Sicily – I visited there about two years ago but before I was blogging. From a travel (rather than food) point of view make sure you visit the Aolian islands – they are stunning. I’ve been to Duomo 3 times and I think it is one of the best restaurants in that part of Sicily. Ciccio Sultano . the chef – is a real Maestro in my opinion. I am sorry you didn’t like the experience! Hi Natasha, I hope you will enjoy my Sicily posts. Thank you for your comments. I totally respect your opinion. I didn’t dislike the meal at all. In fact there were certain things I really enjoyed. 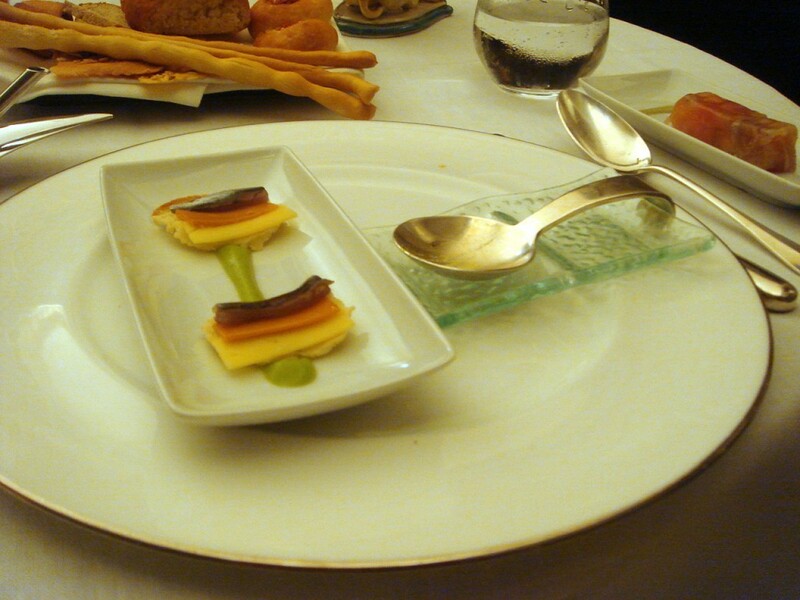 But I didn’t love it, and given that Ristorante Duomo is a 2 star Michelin restaurant, I think the experience should have left me pretty close to loving it. I cannot necessarily fault Ciccio Sultano’s technique and I can definitely tell that the restaurant is one of the best, if not the best, in Sicily. I also applaud his creativity and his ideas and I recognise that he is a great Chef. But for me, great food (and the enjoyment of it) comes from the maximisation of flavours – the Chef being able to extract the best out of the ingredients used. Also, its about achieving a poised balance in the composition of a dish as all the flavours must work together, especially between sweet and savoury. In more than instance, while I may have liked the concept of the dish, they didn’t always have the balance I thought needed to make it a truly perfect meal. Some things were too sweet, and on occasions certain ingredients overwhelmed that of others. 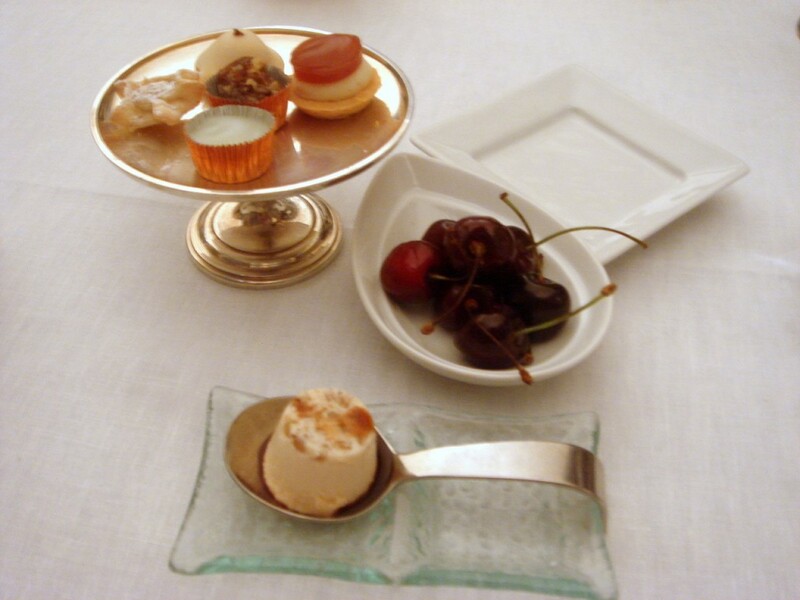 But I suspect, and I alluded to this my write-up, that Sicilians might have sweet palates, and that the Chef caters to this.